TWO LEAD LIGHT WINDOWS: These windows are the creation of Vic. Burns of North Box Hill Victoria. 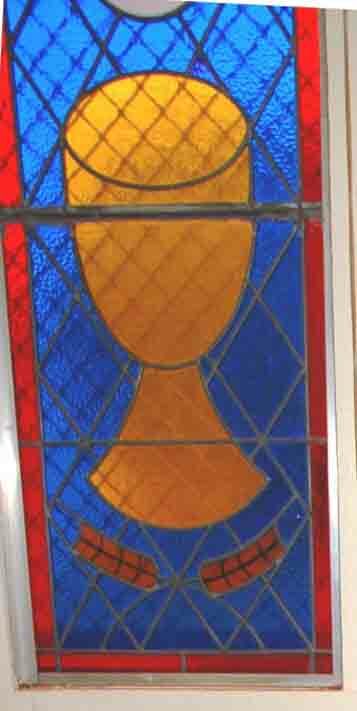 They depict a chalice and host from the holy Mass and the letter "M" for Mary, the mother of Jesus. 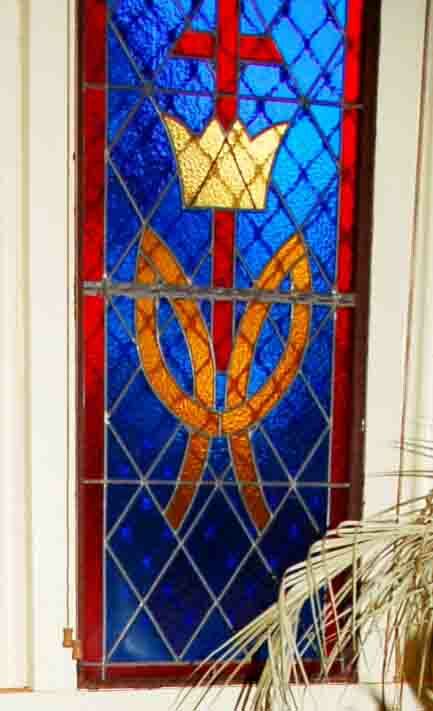 In the small room to the left is an 1880 Leadlight from the Carmelite church of Port Melbourne Victoria. 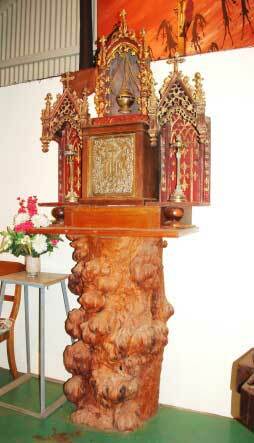 LECTERN: The lectern from which God's holy Word is read is made from the trunk of a Djoan tree, an energy and healing tree to local aboriginals and found in many places around Kalumburu. The trunk of the Djoan tree is covered with a grey coloured bark which when removed and soaked in water for a period of time produces a broth that is carried in a mainbun (conch shell) to provide nourishment for travellers making a difficult journey. 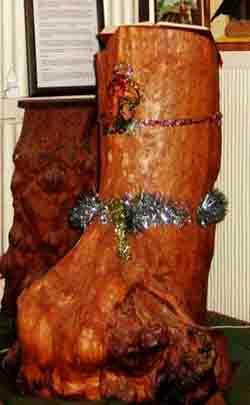 The Djoan tree is famous for its burls, one of which has been used for the lectern. 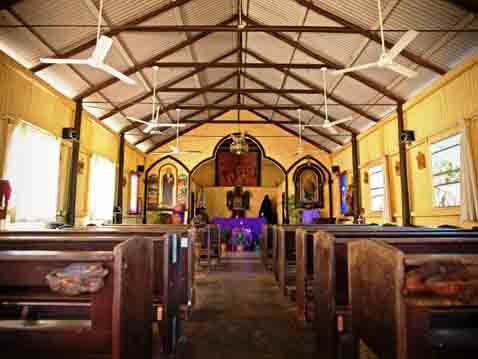 Note that there are other Djoan burl stands around the sanctuary adding a touch of nature and dignity that speaks to the local people. Volunteer Henry Greer, brought the tree trunks in from the bush while Kiana Zeppa, another volunteer, carefully removed the bark, one chip at a time to reveal the dignity of the Djoan burl. THE TRIPTYCH OF ST. BENEDICT AND BENEDICT BALBEN: To the left of the altar on the Iconostasis wall is a triptych painting of St. Benedict, born c 480, and Benedict Balben, born c 1880. The painting is by Thomas Tesselaar of Adelaide South Australia. 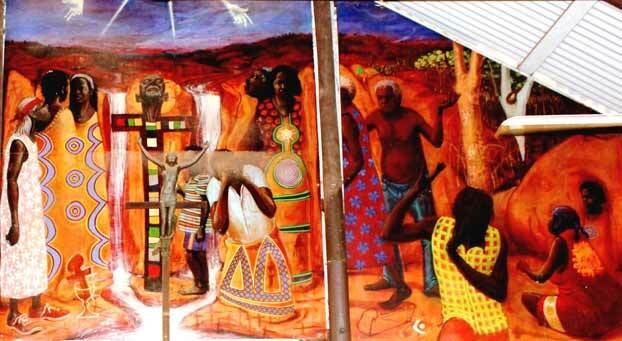 It depicts the remarkable story of the Baptism of the first Christian convert in the Pago-Kalumburu area. The story is this. Two of Balben's friends travelled to Pago settlement asking in the Pe'la language for someone to "pour the water" for an old man, Balben was laying gravely ill at his yurra (humpy) "away, away, far away". Father Cubero set off on the return journey with the two friends acting as his guides. At the Drysdale River they made a raft to float Father Cubero across the racing water. After walking many kilometres Father Cubero and his two guides were astonished to meet the old aborigine when he came rushing towards them, apparently fit and healthy. Father Cubero baptised the old man, giving him the baptismal name of "Benedict", but wondered how he knew to ask for baptism. Some days later, after Father Cubero had returned to the Pago Mission, Benedict arrived strong and well and apparently healed by his baptism. 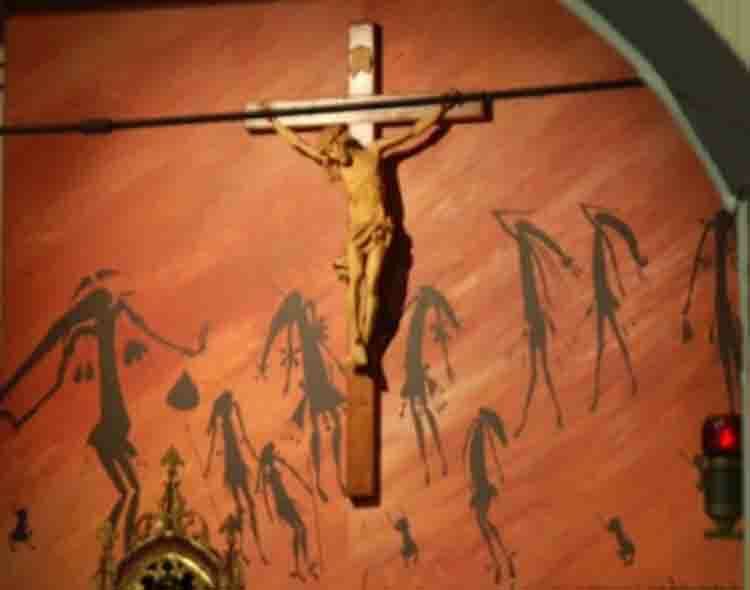 Balben wanted to stay and help the missionaries, which he did for the remainder of his days, all the while urging many in the aboriginal community to "ask for the water". 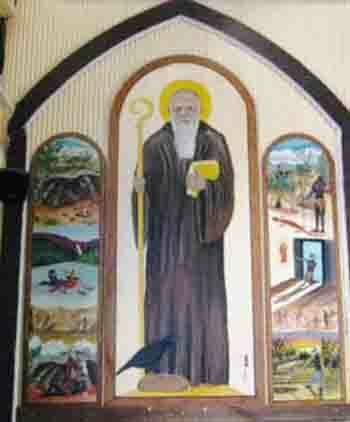 The mystery of Balben's own baptism was resolved when one day in the parlour of the Pago monastery Balben saw a picture of St Benedict. He ran outside in great excitement and brought "big mobs" of his people, all smiling and talking at once and pointing to the picture, he announced that this was the man who had come to Balben in the dream and told him to ask "for the water". THE ASSUMPTION OF THE BLESSED VIRGIN MARY: On the other side of the altar to the triptych, on the iconostasis wall is a painting of the assumption of the Blessed Virgin Mary, for whom the mission and parish were named. 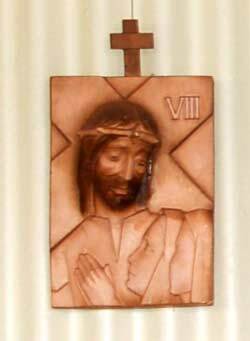 It is set in an original frame of Spanish wood carved by the artist John Caselles and brought to Australia by mission founder Abbot Fulgentius Torres, OSB. 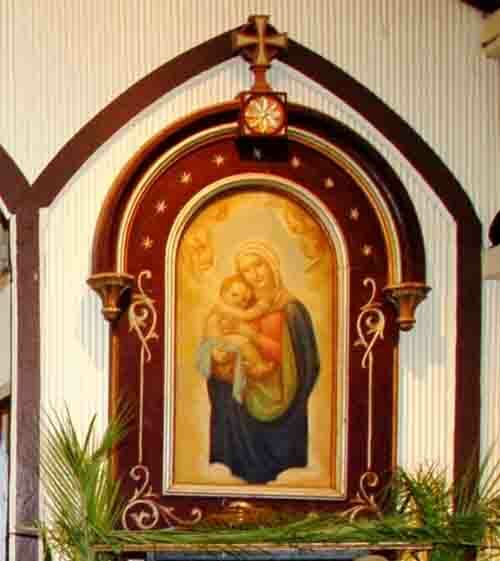 This frame hung in the first Pago Church with the painting of Our Lady by Fr. Lesmes, OSB. 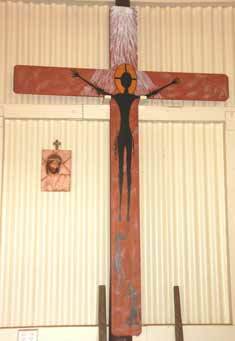 THE CRUCIFIX: Above the Tabernacle and as a backdrop to the Crucifix is a painting in the Kira Kiro (Bradshaw) style which is unique to the Northern Kimberley. 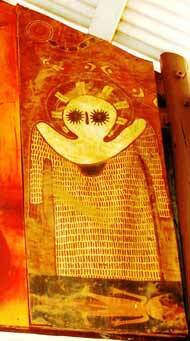 The Kira Kiro (Bradshaw) style is agreed to be tens of thousands of years old and predates the current aboriginal rock art styles. 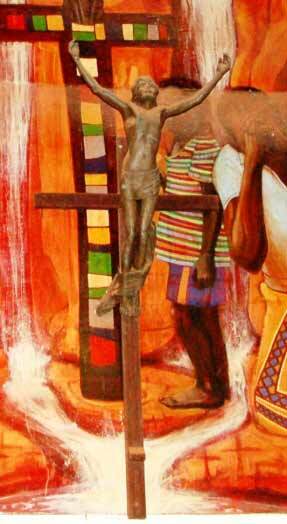 The painting is the work of Kalumburu mother of three, Cassandra Waina. 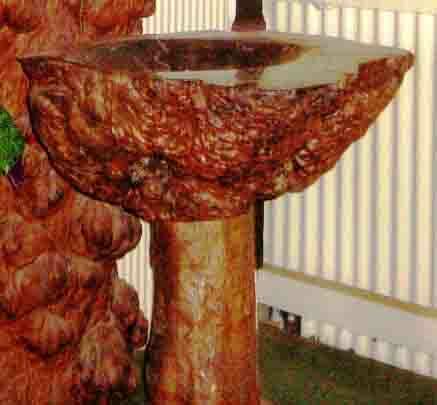 BAPTISMAL FONT: The baptismal font was fashioned from the burl of a Djoan tree by volunteer Brendan Oversby of Bindoon Western Australia and presented to the mission in 1995. 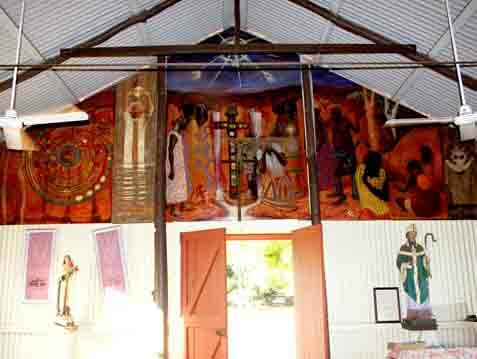 PATCHWORK: The two patch-work hangings on the East wall were made by Dutch volunteer, Caroline Thuijs , STATIONS OF THE CROSS: The symbolic style of the "Stations of the Cross" – the traditional fourteen stops of Jesus on the way to Calvary – is of Spanish inspiration, acquired by Dominic Vallecjo, long serving Brother working in Kalumburu. THE ROOF BEAMS: The beams on the church are original "Curru", Cyprus Pine which is resistant to termite attack and are ready to confront cyclones and storms for another century. The extent of the rebuilding to the fabric of the church following the bombing in 1943 can be seen between the second and third rafter. 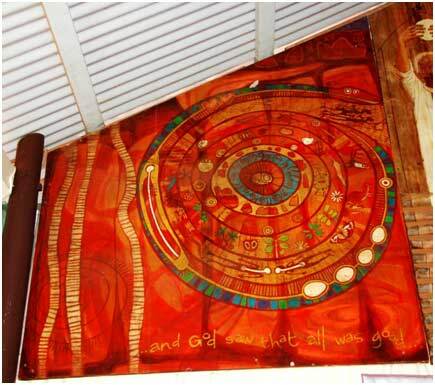 DETAILS: THE CREATION STORY: Of Genesis.1, … and the Serpent. 6. 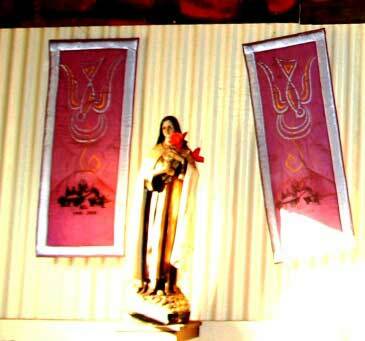 God created man in his own image, in the image of God he created him; male and female he created them.